Last quarter, I was pulled into the slightly odd underground of people running their own autonomous systems, and since then, our circle of friends running autonomous systems at Hurricane Electric's FMT2 has slowly been growing. This is, of course, an issue that real networks have to deal with as well, so when we had an eighth friend sign a service agreement with Hurricane Electric this week, the idea was (half jokingly) floated that we should just start our own Internet Exchange Point to cut down on the number of cross connects we need for each new member. 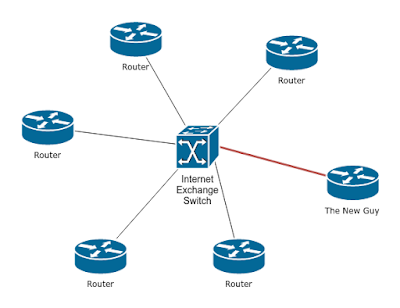 An Internet Exchange is basically just a single L2 Ethernet switch which every network plugs into, such that every network can directly set up BGP peering / route packets to each other network on the fabric. 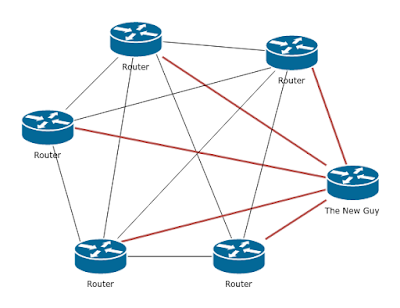 Furthermore, to make it even easier to add new networks to an Internet Exchange, many IXs run "route servers," which are BGP peers which re-distribute all the connected routes. This is convenient because it means that only the IX operator and the new network need to adjust their BGP configuration when a network joins; everyone else is already peered with the route server and start getting the new routes (and which router on the switch to send that traffic to) as part of their already existing connection to the route server. So we were all sitting there, contemplating the idea of ordering seven more cross connects and once again all logging into our routers to update our configs, and at that point, the idea of creating an Internet Exchange instead didn't seem too bad. We could instead have all gotten cross connects into one of the existing Internet Exchanges in the HE FMT2 building, such as SFMIX, but they charge $995/year for a port on their fabric, which is more money than it's worth for all of us to cross connect for amusement's sake (most of us are amateurs and not making money on our networks). So screw it, hold my other beer, and away we go! And that's how the Fremont Cabal Internet Exchange was born. We even made a website and everything. 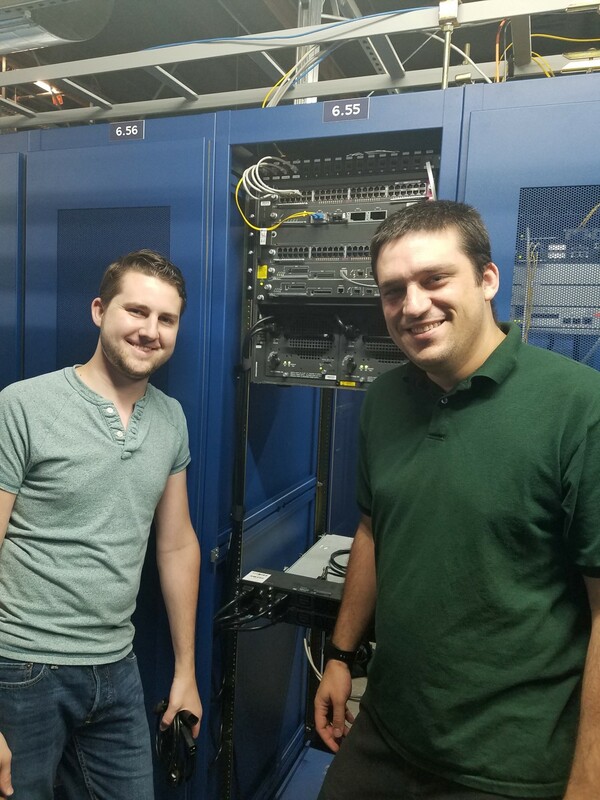 We allocated a /64 IPv6 subnet from my /48 (which was originally allocated from another guy's /32), drummed up an IPv4 /24 that was currently between projects, and very carefully selected the private ASN 4244741280, and all that was left to get was a switch to all connect to. Thankfully, my entire network in my cabinet is built on a Cisco 6506, which is technically a switch, so we called that close enough, and instead of having to find another piece of hardware, just allocated a VLAN on my 6506 as the switch fabric, and we were all set. Besides, we were getting a little worried that there were getting to be too few Internet Exchanges running on Cisco 6500s these days. Now whenever someone wants to connect to the FCIX (Fremont Cabal Internet Exchange) fabric, they just get a cross connect to my cabinet, I set another port to be an access port to the FCIX VLAN, and they're hooked up to everyone. Edit: OK, I stand corrected. peeringDB had no problem and we're now live on there as well. That was not expected. The last piece to really make adding new members to this peering fabric convenient is setting up two route servers, so that each new member doesn't trigger everyone needing to log into their routers to add a new BGP peer. 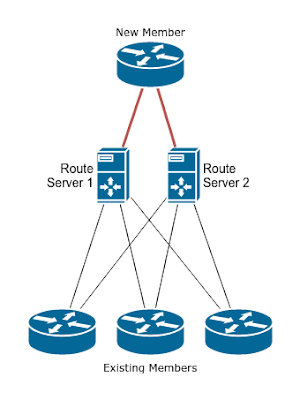 Instead, everyone peers with the route servers and they handle the full N-to-N exchange of routes. When a new member joins, they set up their router on the fabric's /24+/64, and peer with the two route servers, and the only other involvement needed is from one of the IX admins (which is really just me, currently) to add them to the route server. Every other member doesn't need to be involved and can just enjoy the new routes appearing on their router. We have two BGP route servers so as I need to restart each one for maintenance reasons, everyone can still trade routes over the other one and I don't trigger a reconvergence every time I restart the daemon or VM. We even managed to get the second VM on a different hypervisor in Javier's cabinet instead of mine, for further fault tolerance. We're still working to figure out exactly which route server software we want to use. I'm the most familiar with Quagga, but Quagga tries to emulate the Cisco model of all config changes are made on the fly through the console, where I don't want to be hand crafting config changes every time we add a member, so I'm currently taking a crash course in running BIRD as one of our route servers, and will likely be swapping various daemons in for each route server as we learn more. Related to adding the Exchange to PeeringDB using a private ASN is possible. I have a friend who did just that, the Exchange also appear in bgp.he.net and we are using private IP and private ASN. This is AWESOME!! Do you need a ASN to join? NVM just actually read the joining requirements, I don't have pysical presence in FMT2 either :( Cool Project though, Keep it up!! Yeah. We've evaluated it. We're currently just running off a CSV of members and some shell scripts, which has been working pretty well for the current scope of what we're doing. Have you considered using a RIPE ASN for the RS? Lots of LIRs will do them for €50 one time. Much cheaper than an ARIN AS. We hadn't, but €50 is more than free, and I don't see much downside from running a four byte private ASN for now.